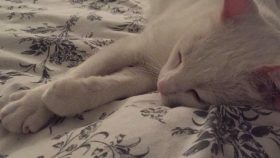 I’m writing some blog posts about volunteering in cat rescue. 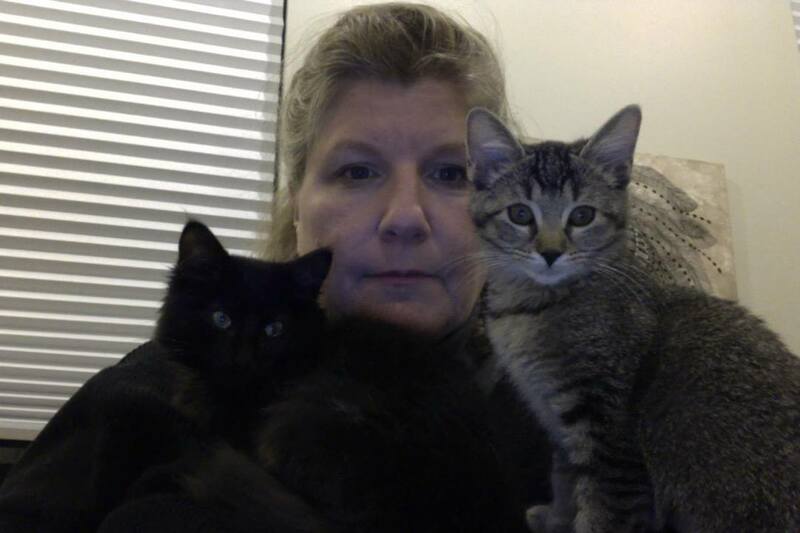 (In the photo on the left, me and two of my fosters, both since adopted.) See Part 1 to find out how I got involved and what it basically entails. 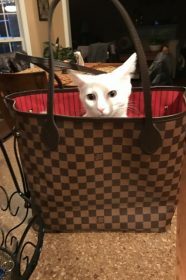 My last post took us up to adoption, the point where someone with an approved adoption application can take home whichever cat(s) they choose or have already chosen from Cat Adoption Team (C.A.T. 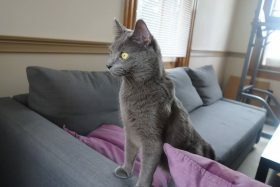 ), the rescue group where I volunteer and for which I have been fostering cats and kittens. I get to see a lot of happy endings, which is the rewarding part. 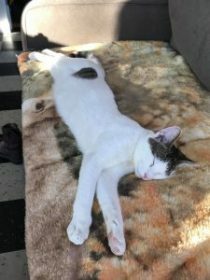 I send my fosters home with people who are so excited to get them, and in our follow-up exchanges days and months later, they tell me how much they love the cats, send me photos so I can see how they’ve grown, and say this pet is a member of the family. That is a long, long way from the ditches and cardboard boxes and sewers and dumpsters where many of our fosters were found. And that happy ending is the best part of animal rescue. Here is a small sample of the photos I receive updating me on my former fosters. It’s not always such a happy outcome, though. Sometimes, it is truly heartbreaking. Of the many kittens I’ve fostered, some have died. A couple of them were living with me when it happened; three died after adoption, in their forever homes, where they were cared for and mourned by people who had looked forward to having years together with them, not just weeks or months. 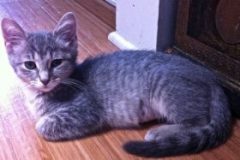 There are diseases that strike without warning, such as feline infectious peritonitis (FIP), killing kittens who seemed perfectly healthy only a few weeks earlier. There isn’t an effective vaccination against FIP, nor is there a cure. As painful as it is to see them die, it’s even worse to learn they’ve died in their new homes. I have felt every time that I have unwittingly brought sorrow to those families, though I had no idea that the apparently healthy kittens I sent home with them would die within weeks or months. Additionally, adoptions sometimes also result in appalling outcomes that frankly make me hate people. We have a clearly stated and written policy that we want our fosters back—no questions asked, no problem, no matter when—if the adopter decides not to keep the cat. Despite this, there are some people who dump or abandon them. 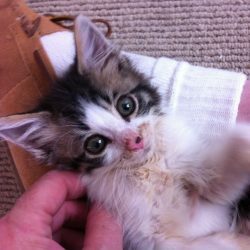 The very worst or these situations is when we get the phone call from a shelter to re-rescue only one of a pair of kittens or cats that we adopted out, and we’re never able to find out what happened to the other cat. When our former fosters turn up at shelters, it is extremely rare that the adopter is frantically searching for them, or wants them back, or has a good explanation, or even answers the phone number we have for them. Finally, despite good people trying hard, sometimes things just don’t work out. 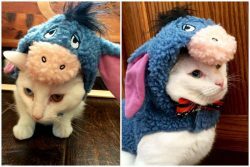 A cat turns out to be a bad fit for a family, or the family’s life changes in unforeseen ways that make keeping the cat untenable… and they return them to C.A.T.. This is sad for everyone, but it absolutely the right thing to do in such circumstances. I will talk about returned cats in my next post about cat rescue. 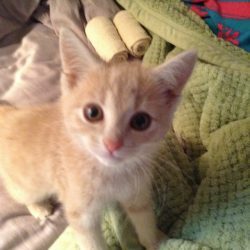 Meanwhile, check out Cat Adoption Team’s How You Can Help page. We welcome donations, but there are other ways to contribute, including something as simple as linking your Kroger card to C.A.T. so that Kroger will donate to our rescue every time you buy groceries—at no cost to you!